Ever since I started playing Magic back in 1995, I have always loved the game's ability to bring people together, to bridge gaps, and build relationships that last a lifetime. It's a telling point that most people start playing Magic with a friend. Heck, I started with a buddy in my junior year of college after we discovered this strange, wonderful card game in a local comic book shop. Magic is inherently social, and our community is as diverse as it is large, uniting tens of millions of players around the world in what is effectively a network of friends. And one of the most important things friends do is support one another. The basis of community is respect. Everyone at Wizards of the Coast feels this way, and we take that sentiment to heart. So a while back we asked for your help shaping a commitment to one another to foster an open, engaging, inclusive community. 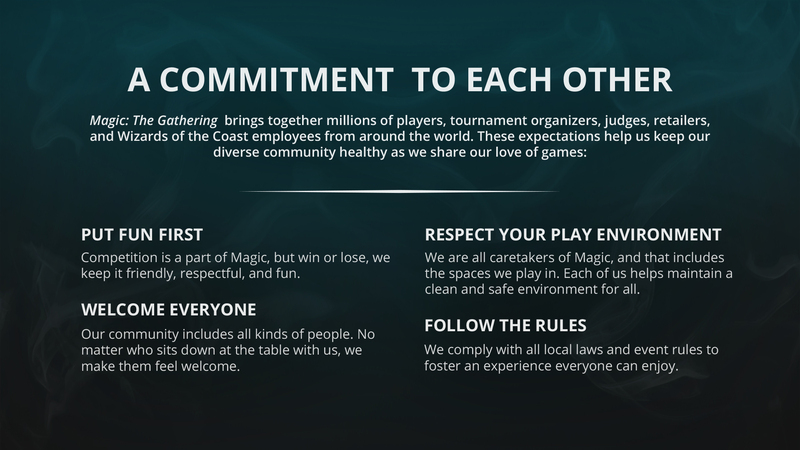 With input from players, retailers, tournament organizers, fans, and staff, this Commitment to Each Other represents the kind of community we all want to be. Friends hold each other accountable. Friends watch each other's backs. Friends welcome and respect newcomers. The spirit of friendship and a commitment to each other is what sets the Magic community apart as one of the best in gaming. To that end, expect to see this hanging in play spaces soon. This is our commitment to each other. Think of it as evoking the spirit of our Code of Conduct, but by the community and for the community. Here's how we hope this commitment will be used. On our end, we will be working with our partners and stores on how best to roll out, display, and utilize this community commitment. Don't be surprised to see this posted in your local store or on stream with your favorite content creator. On the community's end, this commitment can be a tool players can point to in order to help keep play spaces fun. This commitment only works if we all want to make a positive, awesome community and we use this as a guiding light. Should you spot an issue, contact the owner or operator of the store, stream, or play space first. They will hopefully be ready and willing to address any issues locally. However, if you feel the need to escalate the issue, you can contact Wizards of the Coast directly to report any serious issues by getting in touch with Customer Support. Of course—and this is important—if you do say something, please do so in a constructive way. Sometimes a lapse in judgment can be an opportunity to learn and grow. The goal isn't to attack anyone who falls short, but to make our community as welcoming and inclusive as possible—and maybe even make a new friend. In that spirit, we're not even close to done working to make the Magic community the best it can be. Everyone at Wizards of the Coast wants to foster inclusive, positive, inviting places and groups for all Magic players, so that the next time a pair of friends shows up at a local game store, they find a community as welcoming and as awesome as I did. So we're going to keep trying to achieve that. That's our commitment to you.